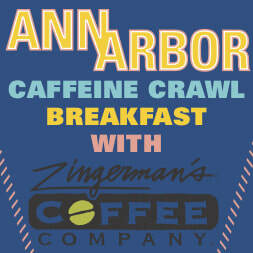 Fuel up Saturday morning with breakfast and coffee, plus good times at Zingerman's Coffee Company (3723 Plaza Drive). Tickets are $5 for those going on this Caffeine Crawl, and $10 for those that aren't. Only 25 spots are available, so be sure to RSVP quickly by getting your ticket. This breakfast will be buffet-style, including good eats from Zingerman's Coffee Company toast bar, pancakes from Zingerman's Cornman Farms, a variety of pastries from the Zingerman's Bakehouse, and even sweet goodies from Zingerman's Candy Manufactory.